December 17, 2009 (New York, NY) – Sixty years after the untimely death of the great American rabbi and writer Milton Steinberg, author of As a Driven Leaf, an important second novel by Steinberg will be published posthumously by Behrman House in March 2010. Discovered deep within the archives of the American Jewish Historical Society, The Prophet’s Wife delivers the lush narrative and vivid depictions that readers of As a Driven Leaf will recognize as the inimitable voice of Milton Steinberg. Set against a backdrop of unrest in ancient Israel, The Prophet’s Wife is a stirring portrait of the biblical prophet Hosea, his passionate and free-spirited wife Gomer, and a people seduced by the lures of power and idolatry to betray their faith. Left unfinished by his death at age 46, the 440-page typewritten manuscript of The Prophet’s Wife sat in the American Jewish Historical Society archives for over forty years before Behrman House located it and began the process of finishing the work. Through trial and tribulation, it was artfully developed into an artistic and intellectual collaboration between Steinberg and a triumvirate of important contemporary writers—Rabbi Harold S. Kushner, Ari L. Goldman and Norma Rosen. 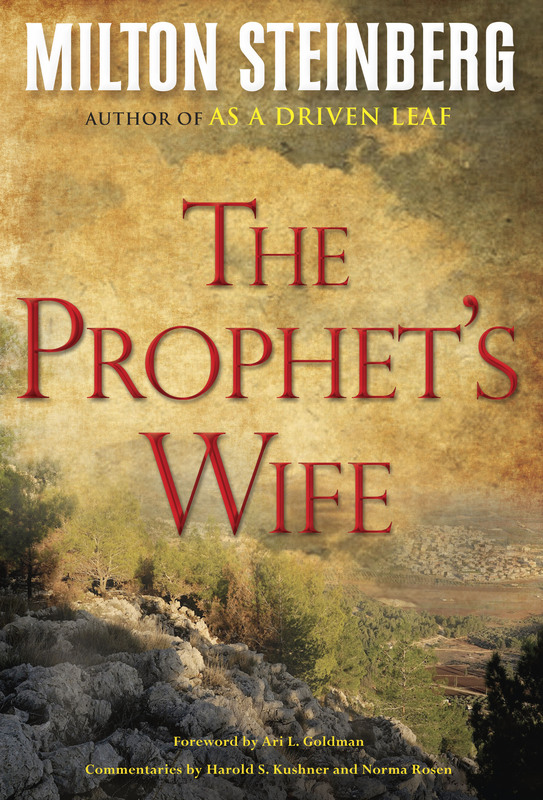 The forthcoming publication of The Prophet’s Wife represents a great literary event. Even prior to publication, the book has created excitement and attracted critical acclaim in many literary circles. “A glorious new novel emerges—unfinished, cut off by mortality; nevertheless equally powerful in its living imagery, passion, and humanity,” exults Cynthia Ozick, National Book Award finalist and author of The Shawl and Heir to the Glimmering World. At a time when works of Biblical fiction have seized the imagination of the reading public, as evidenced by the success of Maggie Anton’s Rashi’s Daughters series, The Women of Genesis series by Orson Scott Card, and of course, Anita Diamant’s The Red Tent, The Prophet’s Wife elevates the genre to a new level. The novel further illustrates the durability of biblical narrative, demonstrating the relevant and enduring nature of the stories, and the echoes they have even today in our modern lives. The commentaries by Kushner and Rosen and the foreword by Goldman contextualize and complete the work, explaining how it came to be and beginning the exploration of what it means to today’s modern reader. “Steinberg’s unfinished story of the prophet Hosea, with the . . . contributions of three brilliant intellectuals, will interest many readers by both its historical content and literary style,” states Elie Wiesel, Nobel laureate and author of Night and A Mad Desire to Dance. Ordained at the Jewish Theological Seminary in New York, Steinberg was greatly influenced by Mordecai Kaplan, the father of the Reconstructionist movement. Active in communal affairs and an avid Zionist, he served as a congregational rabbi, most notably at the Park Avenue Synagogue. In addition to As a Driven Leaf, he published three other works—The Making of the Modern Jew (1934); A Partisan Guide to the Jewish Problem (1945) and Basic Judaism (1947). His articles were collected by Arthur A. Cohen and published posthumously as Anatomy of Faith (1960). Behrman House has launched a national and international promotion campaign for The Prophet’s Wife, which includes public events and programs. In addition, supplementary materials, including book group questions, are provided at the end of the book. And, in an innovation designed to encourage further exploration of the work and its meaning, Behrman House has launched a website in which readers are encouraged to share their reactions, debate the themes of the book, and even write their own ending. Please visit www.prophetswife.com for further information. To request a review copy of The Prophet’s Wife or for further information about this important work, please contact Shira Dicker at shira.dicker@sd-media.com or by phone at 917.403.3989. Behrman House is the leading publisher of educational materials for Jewish supplementary schools, and creators of diverse books about Judaism and Jewish life. Founded in 1921, the firm has previously published such classic titles as My People by Abba Eban, Israel’s first Ambassador to the United Nations, As a Driven Leaf by Rabbi Milton Steinberg, the New American Haggadah by the founder of the Reconstructionist movement Mordecai Kaplan, and Hitler’s War Against the Jews by Lucy Dawidowicz. Behrman House is the winner of two Distinguished Achievement Awards from the Association of Educational Publishers (2007).